Stand on the ground with one foot resting on the box, heel close to the edge. 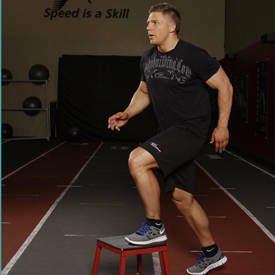 Push off with your foot on top of the box, trying to gain as much height as possible by extending through the hip and knee. Land with the same foot on top of the box, returning your other foot back to the start position.